NASA's planet-hunting Keplerspacecraft is back on trackafter a glitch this week cost it about 13 hours of lost time forscience. 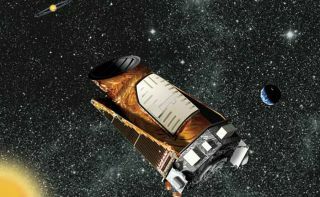 The space telescope has been orbitingthe Earth since March2009, searching for signs of alienplanets around other stars. During a check-in with the spacecrafton Monday (Dec. 13),scientists found that Keplerhad switched to the wrong guidance system for determining in whichdirection topoint. Instead of being in finepoint attitude mode, which allows thetelescopeto target stars with fine accuracy, Kepler was in coarse pointattitude. Thismode uses star trackers for pointing, rather than the fine guidancesensorsmounted to the telescope. Engineers were initially unsure whatcaused the issue. "They determined that Keplerfailed to transition properly from coarse point to finepoint attitudeafter apre-planned momentum wheel de-saturation," a regular maneuver thespacecraft makes to stay in the right orbit, according to a NASArelease. "The project team was able to recoverthe spacecraft tofinepoint relatively quickly," the statement said. "Only 13 hours ofscience data collection were interrupted by this anomaly." "The mission remains well within thebudget outagesallowed," the statement said. Astronomers have found more than 500extrasolar planetsaround alien stars, and Kepler has aided the search. In particular,Kepler isaiming to find Earth-likealien planets that might have the right characteristics tohostextraterrestrial life.